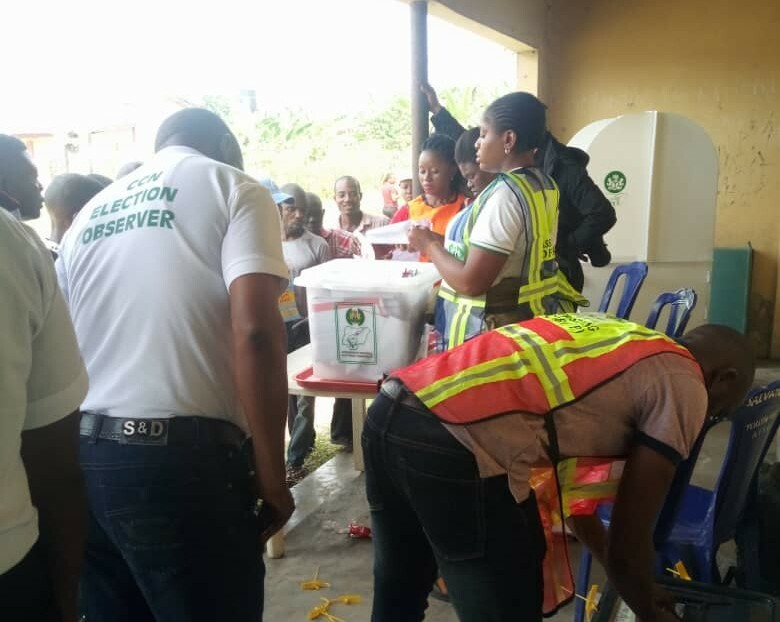 About 503 voters in Ikot Nya in Nsit Ibom Local Government Area of Akwa Ibom State might be disenfranchised following a personality clash between two former military administrators from the area. Former military administrator of Ogun and Rivers states Capt. Sam Ewang (retd) and the former military Commodore Idongesit Nkanga (retd), who happen to come from the same village are at war as to whether the election should continue or not. Ironically both men who are cousins, are chairmen of APC and PDP governorship campaign organisations respectively. While Ewang is the chairman of Nsima Ekere of APC campaign team, Nkanga is the chairman of Udoma Emmanuel’s Divine Mandate Organisation. Election had to be stopped on Ewang’s order on the grounds that PDP had brought in mercenaries to vote for their party. “Nobody is going to vote again. That’s what they did during the last election and won. “Some people had voted elsewhere before and they went and brought them here to vote. It will never happen again this time around. The only solution is to stop the election” Ewang told our correspondent. But Nkanga who was busy pleading with the people to be calm told our correspondent that the allegation was false. “Who are the mercenaries? Let them point out those who have voted before. They just want to disrupt the election. That has been their plan. They want to cause trouble. “You see people are going. We could have finished voting by now,” Nkanga lamented. The NYSC polling officer said only 202 person had vote before 1 pm when voting was stopped out of the 705 people in the unit officially called Age Ewang, Unit 3, Mbiaso Ward 4, in Nsit Ibom Local Government Area of Akwa Ibom State.